MISSISSAUGA, Ont. - Ontario's Liberals would refuse to strike any deals with their rivals in order to form a minority government if they fail to win a majority of seats in Thursday's election, Premier Dalton McGuinty said Sunday. 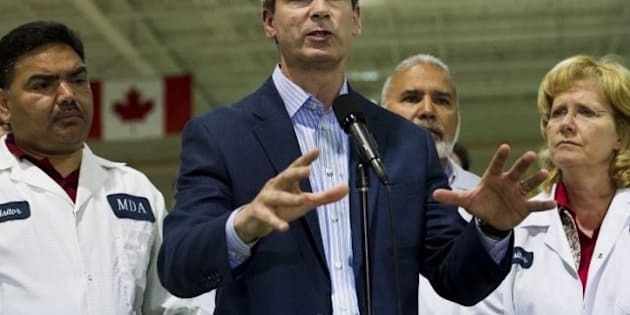 In a letter to Progressive Conservative Leader Tim Hudak, McGuinty ruled out forming a coalition with either the Tories or New Democrats. "I am running to form a Liberal government – and only a Liberal government," he wrote. "There will be no coalition with either your party or the NDP." But he went even further when later pressed on whether he might work with the NDP in some capacity to form a minority Liberal government if needed. "No coalition, no accord, no agreement, formal or informal, or any other linkage of any kind," McGuinty said. Polls have indicated the Liberals and the Progressive Conservatives were in a dead heat heading into the final week of the campaign, with the New Democrats trailing but picking up support. McGuinty refused to acknowledge even the possibility of a minority scenario _ or the need to work with rival parties — insisting the Liberals "won't have to worry about that." In 1985, Ontario's the Liberals came to office as a minority government with support from the NDP in exchange for a pledge to pass certain legislation. In recent days, Hudak has been accusing McGuinty of planning "backroom deals" with the New Democrats. Earlier Sunday, he warned that Ontario could end up with the Liberals and NDP scheming together to hike taxes. "The Liberals and the NDP: they'll increase taxes and they'll spend money on everything under the sun," Hudak said at a campaign stop. When asked if he would work with the New Democrats if they dropped their plan to raise the corporate tax rate, Hudak indicated he wasn't interested. "I'm in this election to win and bring change, not play 'Let's Make a Deal'," Hudak said. NDP Leader Andrea Horwath was evasive when asked if she would rule out a coalition. "Mr. McGuinty is busy talking about himself and his own issues; what the people of Ontario are interested in is what any government will do for them after Oct. 6." Horwath talked up what an NDP government would do during its first 100 days in power, stressing priorities such as cutting the HST from hydro bills and freezing tuition. While Horwath could hold the balance of power in a minority situation, the Liberals said McGuinty had addressed his letter only to Hudak because of the Tory leader's accusations of backroom dealings. The premier also accused his opponents of using talk of a minority as political ammunition. The strategies are reminiscent of Prime Minister Stephen Harper's, whose spring election included frequent warnings that the federal Liberals and NDP would scheme to form a coalition if his Conservatives did not get a majority.